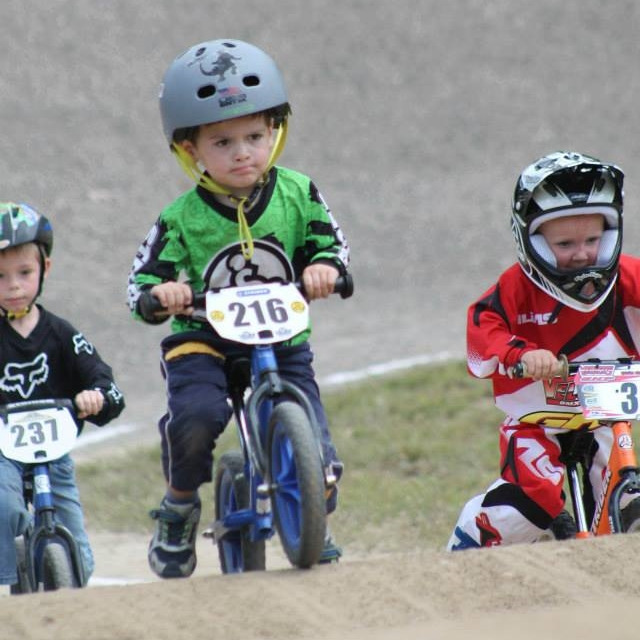 That's right, with the STRIDER class, even 2 year-olds can race BMX! If your child can walk, your child can ride! No prior experience is required. We have loaner STRIDER bikes at the track so young racers can give a try before buying a bike. All that is needed is an approved bicycle helmet, long pants and a long sleeve shirt. It only takes two riders to make a class and all receive awards. So, bring your toddler or pre-schooler out to the track for some racing fun and excitement! Have a question not answered here? Please contact us! STRIDER balance bikes are industry-leading training bikes that help toddlers and children of all abilities and as young as 18 months learn to ride on two wheels. STRIDER balance bikes focus on the fundamentals of balancing, leaning, and steering without the distractions and complications of pedals or training wheels. The STRIDER’s simple, no-pedal design builds confidence and eliminates fear by allowing kids to have their feet on the ground and progress at their own pace. This unique design teaches young children balance on two wheels right from the start, avoiding developmental delays typical with tricycles and training-wheel bikes.